With the new Bosch MaxxiMUM Kitchen Machine MUMXL40G (RP: SG$1,699) and MUMXL20T (RP: SG$1,499) I am sure anyone can bake like a pro. The MaxxiMUM range comes with 1,600 watts featuring the professional silicon stirring whisk and a 3D PlanetaryMixing accessory which moves kneading hooks and whisks in three directions simultaneously. Very awesome right! Between the two new model, the enhanced MUMXL40G model has a continuous shredder with four discs such as Reversible shredding disc, Grating disc, Asia-vegetable disc and the Professional Supercut reversible disc to assist with chipping, dicing and shredding of ingredients for both Asian and Western delights. Furthermore its 1.75 litres ThermoSafe blender also comes in handy while preparing any recipes from hot soups to frozen fruits. The Bosch MaxoMixx MSM87180 Hand Blender (RP: SG$219) has a effortless and comfortable handling because of its ergonomic non-slip, soft touch handle. This 750 watts hand blender also comes with 12 speed settings and a four-winged Quattro blade stainless steel foot which is similar to my Bosch MSM67160 ErgoMixx Hand Blender. But when compare these two hand blender together, the latest model has extra gadgets such as a mini food chopper which is handy for chopping small portions (eg, nuts for baking) and ice crush blade that ease the task of making smoothie and cocktail. Between for this coming Mother's Day, from 11th April - 11th May 2014, BOSCH is extending a special price of up to SG$200 off its range of food preparation appliances, coupled with complimentary gift with purchase.So if you are keen to know more details or take a close look of the above-mentioned Master Gourmet machines, you can head down to Bosch Kitchen @ Tangs Orchard or via their online store at www.bosch-home.com.sg/store. While waiting for the cooking demo to start, we were also being served with some light refreshment such as buns and pastries together with fresh cut fruits and beverages. Love the fragrant aroma of the Earl Grey Lavender from Gryphon Tea artisan selection. A Quick Introduce: Chef Stephan Zoisl is one of the chefs from My Private Chef @ The Studio who has worked at some of the world's best restaurants including the two-Michelin starred Steirereck in Vienna and two-Michelin starred Restaurante Vila Joya in Portugal. And he is also our chef in-charge at the Bosch Master Gourmet Launch sharing some recipes demonstration using the two powerful and convenient BOSCH new kitchen machines mentioned above. Beside the products launch, cooking demonstrations and tasting there is also a "hands-on" session for participants to try out their new machines base one of the dish demonstrated by Chef Stephan. 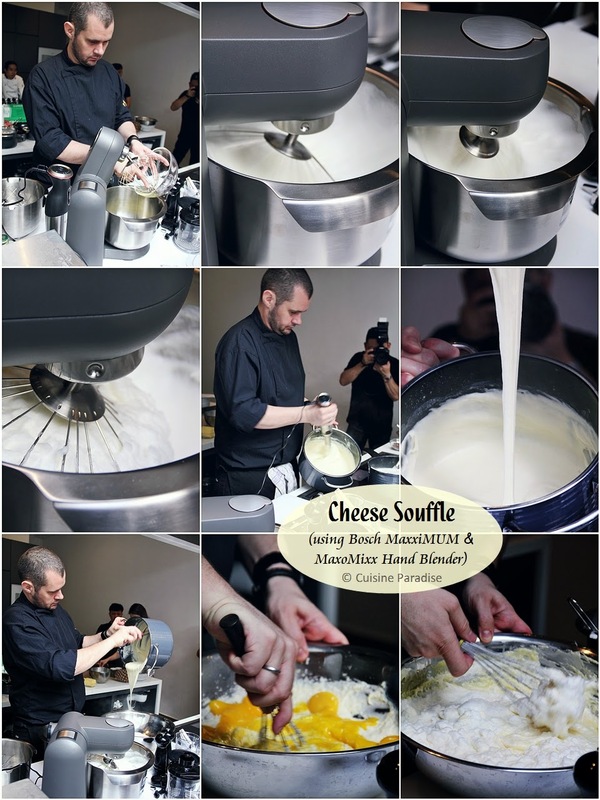 Below are 4 recipes shared by Chef Stephan using Bosch MaxxiMUM and MaxoMixx Hand Blender which you might like to take a reference and try to replicate them at home too. I am sure everyone would love to have a glass of this icy smoothie anytime of the day especially during this hot weather or for weekend breakfast to go with some toast, scrambled egg or even granola. 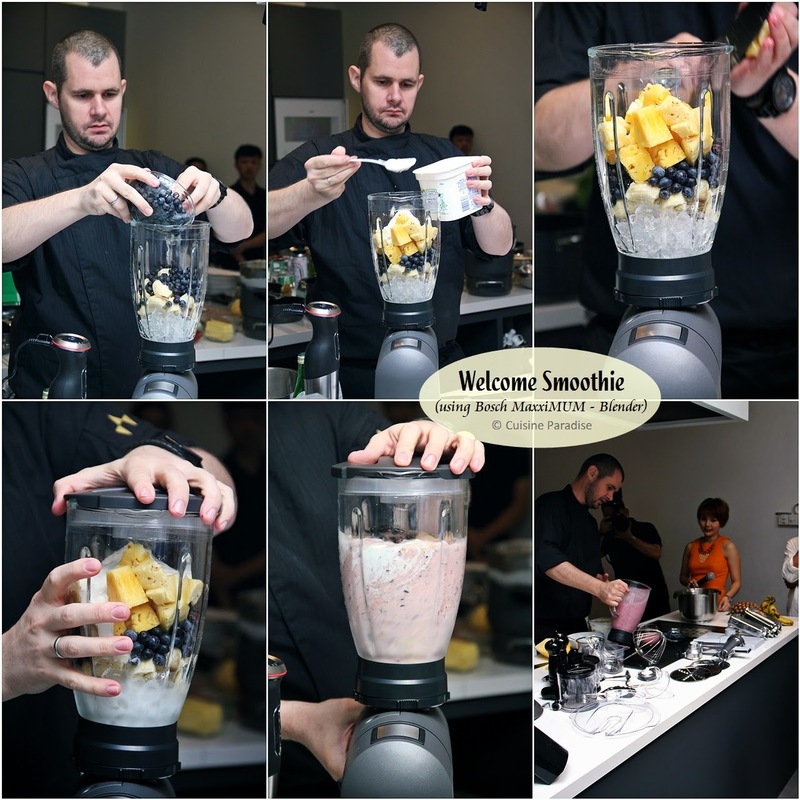 With the help of the new Bosch MaxxiMUM; 1600 watt machine which comes with a 1.75 litres capacity ThermoSafe glass blender, it just makes smoothie wonderful with that bits of crushed ice that compliments the overall taste. 1. Place the bananas, pineapple and blueberries into the blender. 2. Add the yoghurt and crushed ice. 3.Using the MaxxiMUM Kitchen Machine Blender attachment, pulse the fruits and afterwards blend till all the crushed ice is incorporated. While we are enjoying our Welcome Smoothie, Chef Stephan continue to work on the second recipe which was Cheese Soufflé with Bacon Ice Cream serve together with some crisp bacon chunks and Chicharoon. This is a heavenly combination if you are a cheese and bacon lovers. Even though the soufflé served might be the best that I have eaten but the bacon ice cream definitely adds extra flavour to it. Give this recipe a go if you love "strong flavour" dessert and I am sure your guests or loved ones will be impressed by you too. Soufflé is a lightly baked cake made with egg yolks and beaten egg whites which can also be combined with various other ingredients and served either as a savory main dish or dessert. This bake has been in my "to-do-list" for very long time but I still do not have the courage to try it as I heard from other bakers it is quite difficult to handle the batter (mixture of yolks and whites) as well as getting the soufflé to raise. But after seeing the step-by-step soufflé making demonstration by Chef Stephan, I think it did helps to boost up my confident to try out this bake soon. 1. Preparing the souffle dish: Heat oven to 200C/fan; 180C/gas 6 and place a baking sheet on the middle of the shelf. Butter 4 x 5cm souffle dish generously, then sprinkle in the breadcrumbs and rotate the dish to ensure the butter is evenly coated. Tip out any excess breadcrumbs. 2. Making a thick white sauce: In a pan, melt the butter over a medium heat; sir in the flour and mustard. Cooking, stirring, for 1 min. Take off the heat and gradually stir in the milk, mixing it in thoroughly before adding more. Return to the heat and stir continuously until very thick (around 10 mins). Transfer to a bowl and allow to cool. Crack the eggs, placing the whites into a clean bowl and stirring the yolks into the sauce. Stir in cheddar and season well. 3. Adding the egg whites: Using a MaxoMixx Hand Blender whisk attachment to beat the egg whites until peaks form that just hold their shape (electric is the best as it will make the job much quicker). Then take a metal spoon and gently stir the whipped whites into the white sauce in a figure of eight. 4. Top-hatting: Spoon the mixture into the dish. Run a cutlery knife around the edge to create a "top hat" effect; this ensures the Soufflé rises above the rim and doesn't stick. Place on the baking sheet and bake for 25 - 30 mins until the top is golden and risen and has a slight wobble. 5. Serve immediately together with bacon ice cream, bacon chunks and Chicharoo. 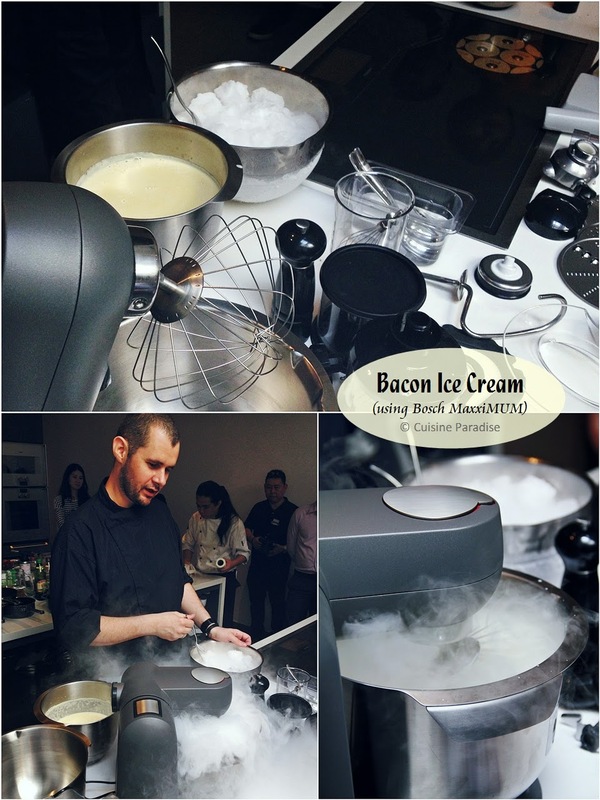 To go with the Cheese Soufflé, Chef Stephan made some really yummy Bacon Ice Cream in just 5 minutes (YES! 5 minutes) with dry ice using the new Bosch MaxxiMUM. And during the demo most of us are amazed with the performance of this machine when it whisk up the ice cream mixture evenly with its new three-dimensional mixing system. On top of that I am also impress with the low noise (almost soundless) operation as compared to another brand of similar kitchen mixer that I have at home. 1. Roast the bacon in a pan till crisp. Remove from the pan and drain on a kitchen towel. 2. Preheat the milk and cream, add the bacon and infuse for 2 - 3 hours (best is overnight). 3. Separately whisk the sugar and the egg yolk till creamy, stir well, add the bacon infused milk mixture into the egg mixture - strain through a chinois and put back onto the stove. Stir constantly till you have reached custard stage. Cool down and transfer into the refrigerator. 4. Once the mixture has cooled down, transfer into a mixing bowl and add dry ice. Stir and wait till properly frozen. Be careful as dry ice has a temperature of minus 78.5 degrees Celsius. 5. Alternative: You can use an ice cream machine and run the programme till the ice cream has set. ~ Dry Ice, sometimes referred to as "Cardice", is the solid form of carbon dioxide. It is used primarily as a cooling agent. Its advantages include lower temperature than that of water ice and not leaving any residue (other than incidental frost from moisture in the atmosphere). It is useful for preserving frozen foods, ice cream, etc, where mechanical cooling is unavailable. - Dry ice sublimates at -78.5°C (-109.3°F) at atmospherics pressure. This extreme cold makes the solid dangerous to handle without protection due to burns caused by freezing (frostbite). While generally nontoxic, the outgassing from it can cause asphyxiation due to displacement of oxygen in confined locations. Here with the help of the pasta attachment (separate purchase) on the Bosch MaxxiMUM we can see how easy it is for Chef Stephan to make those lovely Tagliatelle. Grind the chicken meat using Bosch MaxxiMUM Kitchen Machine with meat mincer attachment for your very own homemade minced chicken meat. 1. Peel onions and garlic. Chop the onions finely, cut the garlic in fine strips using the Bosch MaxoMixx Hand Blender chopper attachment. 2. Preheat a big pot, with a broad surface. Fry the onions and garlic in a small amount of frying oil (Grape seed / Canola). 3. Once the garlic and onions turn a light colour, add the minced meat to the pot. 5. Once the meat is browned, add small dices of carrots and celery. Add the tomato paste and saute for 1 minute. 6. Add the tomato chunks and tomato sauce. Add some water (approx. 100ml). 7. Simmer the sauce for about 20 - 30 minutes or till the meat is soft. 8. Season with salt and pepper once again. 9. Setup a big pot with water and bring to a boil, add fine salt. 10.Cook the pasta (Tagliatelle) to your liking. 11. Prepare a small pot with butter, add some of the pasta cooking liquid to it and once the pasta is cooked, transfer into the smaller pot with butter, season with salt and pepper. 12. Reheat the Bolognese sauce; add fine chopped Italian parsley, chives and basil. 13. Place the pasta onto a plate, add the Bolognese sauce. 14. Shave the parmesan with the Bosch MaxxiMUM Kitchen Machine - Continuous Shredder attachment and plac eon top of the Bolognese sauce. Serve immediately. 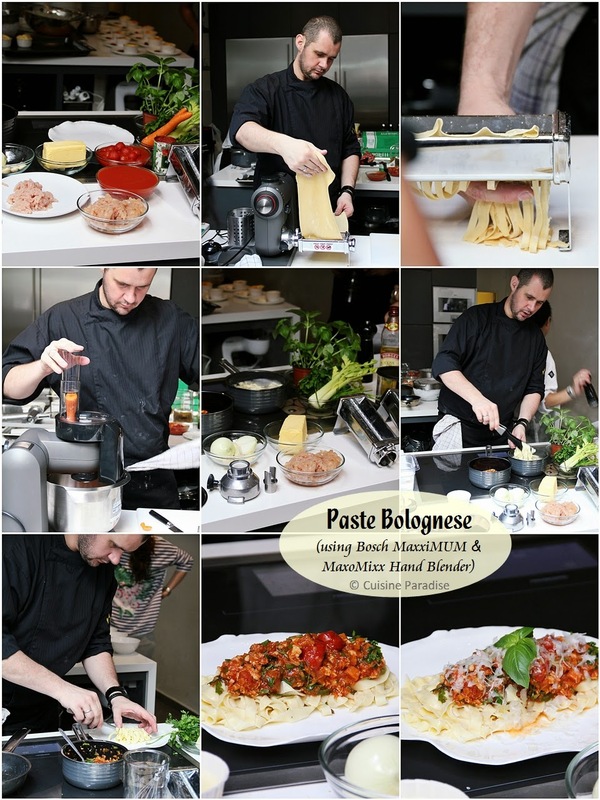 ~ Bolognese sauce will develop flavour over days, therefore best to prepare the sauce 1 day in advance. ~ Original Pasta Bolognese is made with Tagliatelle, not Spaghetti. Bombe Alaska was the last demo dish as well as our "hands-on" plus challenge dish to see how well we can adept to the new BOSCH machines. This lovely dessert it pretty easy to prepare and you can use the BOSCH MaxoMixx Hand Blender to make the accompany sauce (coulis) using berries of your choice. 1. Cut the sponge cake into 8 round slices and arrange on trays that will fit into your freezer. Using an ice cream scoop, place a scoop of ice cream onto each slice of sponge cake, cover with cling film and freeze for about 1 hour. Assure that the ice cream is hard. 2. Cut the strawberries, place it into the Bosch MaxoMixx Hand Blender compartment, add the icing sugar and blend well. Set aside. 3. Use the Bosch MaxxiMUM kitchen Machine to beat the egg whites to soft peak. Add the sugar gradually, beating well between each addition until the sugar has dissolved and the mixture is glossy. Beat in the vanilla. Transfer into a pipping bag. 4. Transfer the ice cream / sponge cake slices onto an ovenproof tray; place the egg white mixture over the ice cream. Make sure it's fully covered. 5. Use a blowtorch to burn the meringue. Alternatively you can use the run and flame the Bombe Alaska. If you don't have a blow torch, preheat the oven to 200 degree C and bake for 4 minutes. 6. 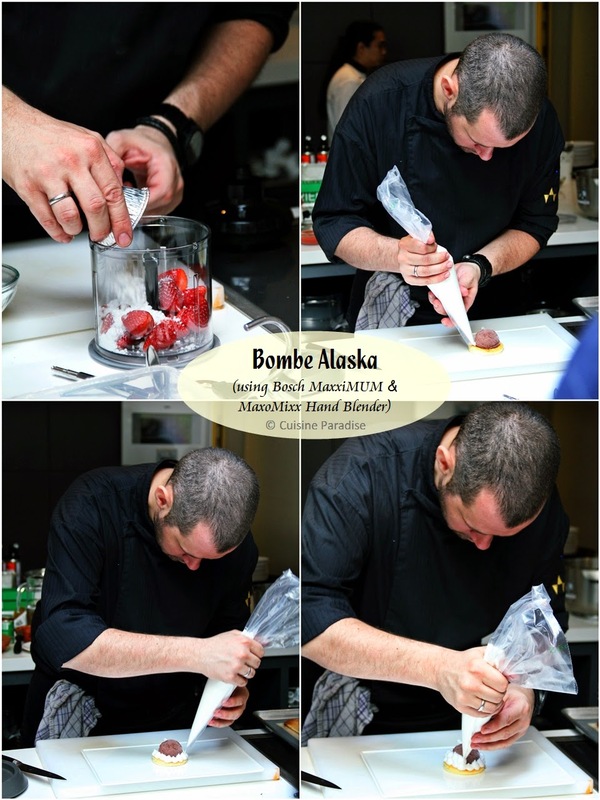 Place the Bombe Alaska onto a plate and serve with the strawberry sauce (coulis). 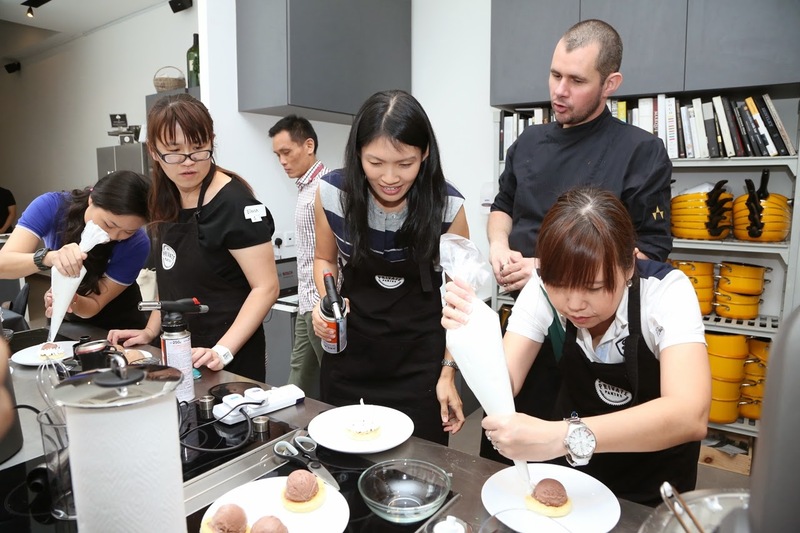 The final highlight of the Bosch products launch event was our "hands-on" plus "challenge" session where we were divided into group of 3 or 4 pax to replicate Chef Stepha's Bombe Alaksa using the given ingredients together with the new BOSCH machines. We named our team "We're The Bomb!!" and these were my teammates Barbara (left) and ShiTing from Lobsterpaints.com (right). We were given about 45 minutes to complete the task and each team needs to design at least 3 - 4 Bombe Alaska. Since all the ingredients were given to the teams with most of the items pre-prepared, the criteria narrow downs to innovative design of the meringue, presentation, overall taste and etc in order to outshine each team. Although it's called "challenge" but after all I guess the most important thing is everyone enjoys the fun time together in the kitchen. During the judging time, Barbara represents our team to give a brief descriptions of our Bombe Alaska design and concept story to the judges. After tasting and discussion among the judges. Finally the MC announced the winning team and we were so surprised that our team came in first with a close margin mark with another team. 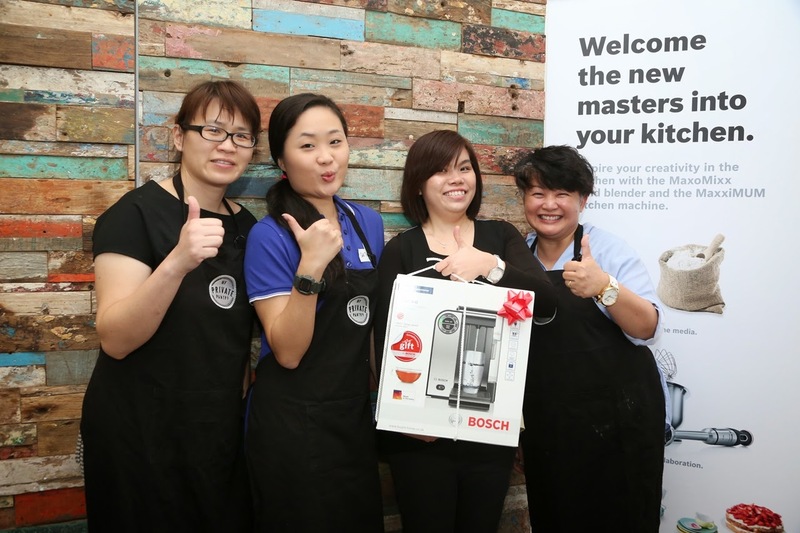 As you could see we were so excited and thrilled to receive each a Bosch Filtrino Hot Water Dispenser which comes in handy with 5 different water temperatures for making different kinds of beverages such as tea. 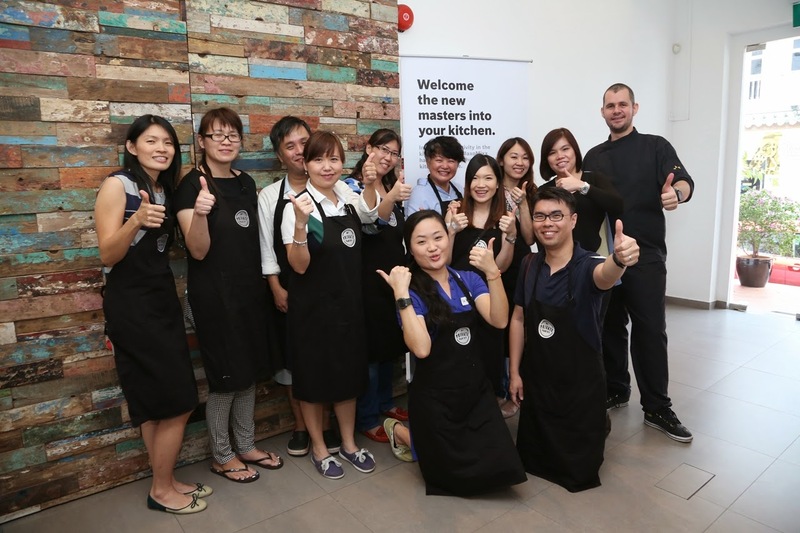 Overall we have a fruitful on-site experience plus hands-on for the new Bosch MaxxiMUM Kitchen Machine and MaxoMixx Hand Blender together with Chef Stephan and fellow bloggers. Lately I would like to thanks Bosch Home Appliances, My Private Chef and Relish PRs for the media invitation. 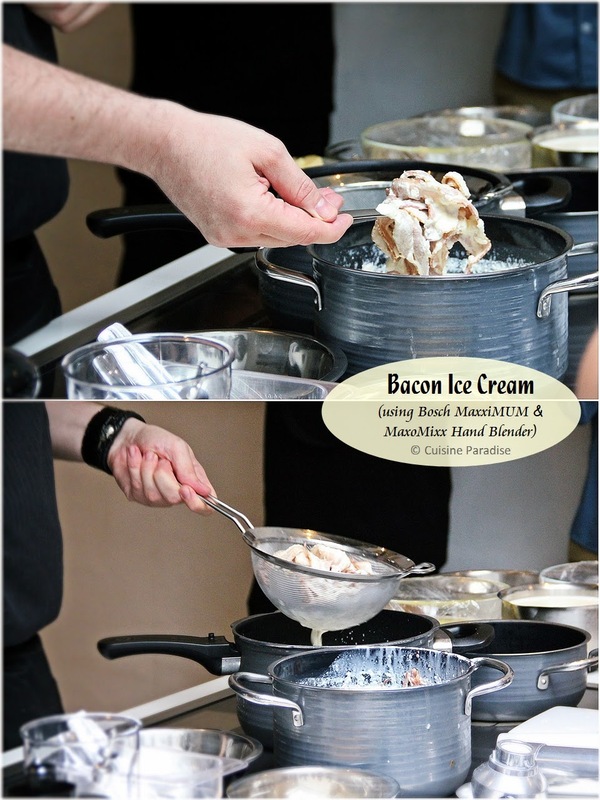 Bacon ice cream! I would love to try that! Interesting recipes. Thanks for sharing.